Home Glucose Optimization Did You Realize Vitamin D-3 Did This For Blood Sugar? Everyone knows you need vitamin D-3 for total health. If you don’t know that, then you’ve been living under a rock where the sun doesn’t shine. No offense, that’s just how popular vitamin D-3 is in natural health circles. Plus, if you don’t know how important vitamin D-3 is chances are you’re not getting enough. Which would mean you’re living life with one arm tied behind your back. Well, figuratively you would be. Not really. I would assume if you are aware of vitamin D-3s health benefits the #1 thing you associate vitamin D-3 with is bone health. This is because several years ago, when vitamin D-3 became popular, it was because studies showed it is essential for strong, healthy bones. Since those studies were released we’ve discovered vitamin D-3 is beneficial for a wide variety of different biological processes. Help fetal growth during pregnancy. Influence the expression of genes that help them operate correctly. Is one very few people know about. Vitamin D-3 has been shown to improve blood sugar. Now before you read further it’s important you know why vitamin D-3 is the kind of vitamin D you want to get in your body. Vitamin D-3 is available as a supplement as well as directly from the sun. And even though it’s a supplement, Vitamin D-3 is the same type of vitamin D you get from sun exposure. This is because when the sun hits your skin, photoreceptors in your skin convert the UV light into vitamin D-3. The reason I tell you this is that there’s another common supplemental form of vitamin D sold today called vitamin D-2. The Vitamin D-2 commonly sold in stores is a synthetic version of D made in a lab. It is not the kind of vitamin D your body makes from sun exposure. You can take vitamin D-2 if you want, but it will not raise the amount of Vitamin D-3 in your blood which is the #1 way vitamin D-3 helps improve blood sugar. So, if you’re going to supplement with vitamin D to improve your blood sugar and make yourself more insulin sensitive, you need to take Vitamin D-3 only. Sorry to belabor the point, but I wouldn’t want you to waste your money and not get the results you want by supplementing with something that simply doesn’t work. Now that I’ve gone over these fine points let’s talk about vitamin D-3 and blood sugar. In recent years we’ve discovered people who struggle with blood sugar regulation often have low vitamin D-3 levels. The theory (and what research shows) is vitamin D-3 helps the body metabolize blood sugar so it’s ready to be used as cellular energy. If there’s not enough vitamin D-3 in your blood it may lead to your body producing more insulin as a result of becoming worse at converting sugar into energy. This may eventually lead to a serious problem where your body becomes less insulin sensitive and will overproduce insulin. The results of which may include excessive weight gain, poor metabolic control, future issues with healthy cardiovascular function, decreasing visual function and more. However, if you’re getting the recommended amount of vitamin D-3 in your diet your body will become more insulin sensitive (which is what you want to happen) and many of these health problems may be avoided. There are a few studies supporting these theories. 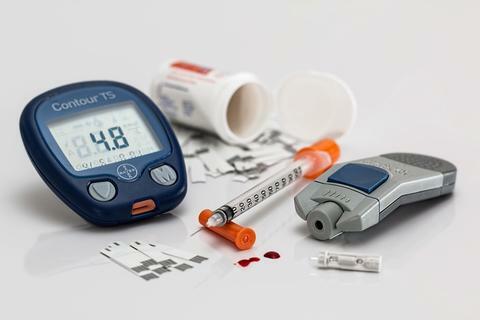 In a 2009 study published in the Archives of Internal Medicine researchers observed that taking 8,500 IUs a day of vitamin D helped to make subjects more sensitive to insulin. In this double-blind, randomized, controlled trial, 100 men who were 34 and older were asked to take 120,000 IUs of vitamin D-3 or a placebo over the course of fourteen days for a six week period. Each group alternated between supplementing with D-3 or a placebo until the end. At the conclusion of the study they discovered taking vitamin D-3 daily improved insulin sensitivity. Fortunately more research indicates vitamin D-3 helps make people more sensitive to insulin and may help you regulate blood sugar better. In a recent study from 2016 a randomized placebo-controlled clinical trial found vitamin D-3 supplementation could help improve blood sugar. The researchers took 60 patients who had problems regulating blood sugar and divided them into two groups. One group was given 50,000 IUs of vitamin D-3 and the other group got a placebo. To see how vitamin D-3 helped improve their blood sugar the researchers took measurements of various blood sugar levels at the beginning and the end of the study. What they noticed is the vitamin D-3 helped to improve fasting blood sugar levels and also improved insulin sensitivity as well. And these two studies are just a handful of similar supporting studies. For a long time we’ve sold other brands of d-3 in our office. But, to more cost-effective for our patients… as well as to help improve d-3 absorption, we recently decided to release our own. This is why we’ve created a MAX strength 7,500 IU vitamin D-3. Which we believe is the strongest, most affordable d-3 around. Our vitamin d-3 is about 300% stronger than most vitamin d-3s on the market. Just one of these a day is all you need to get the maximum benefits. Whether that’s for blood sugar or for bone support. And one bottle will last you 3 whole months. Click here or on the image below to get your vitamin D-3 today.